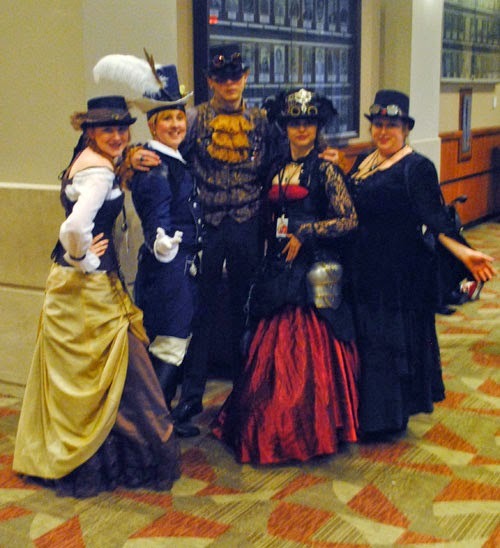 Karmada Arts: Shuto Con 2014 Recap! WOW. First off, HELLO TO ALL THE NEW PEOPLE! If you picked up one of my cards, you MIGHT have stopped across my blog here. 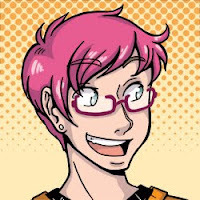 I talk about all sorts of random stuff here, but it usually has to do with art, conventions, publishing stuff, webcomics, cosplay, and all manners of geekery. 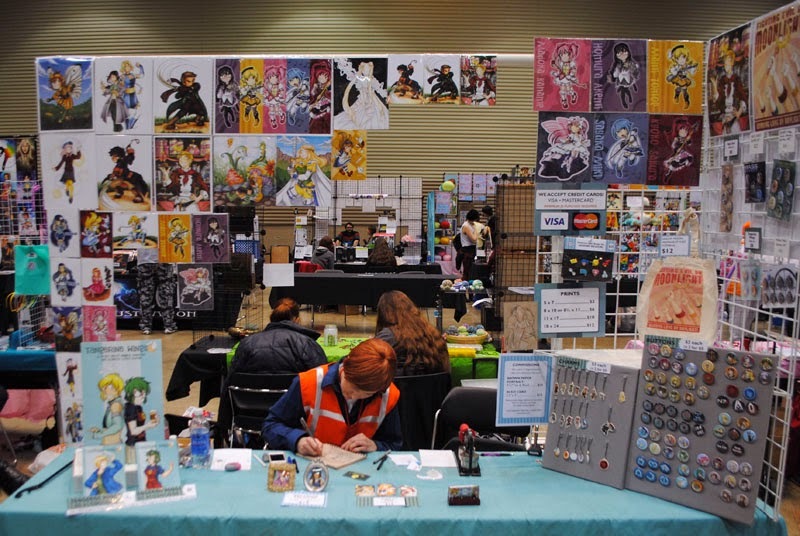 For those who don't know who I'm talking to, I spent last weekend vending at SHUTO CON's Artist Alley! Shuto Con is a little con up in Lansing MI, and I've been vending there since about the first year. Needless to say, you guys kept me pretty busy, between drawing, doing panels, and taking pictures, so my recap will probably be pretty short. 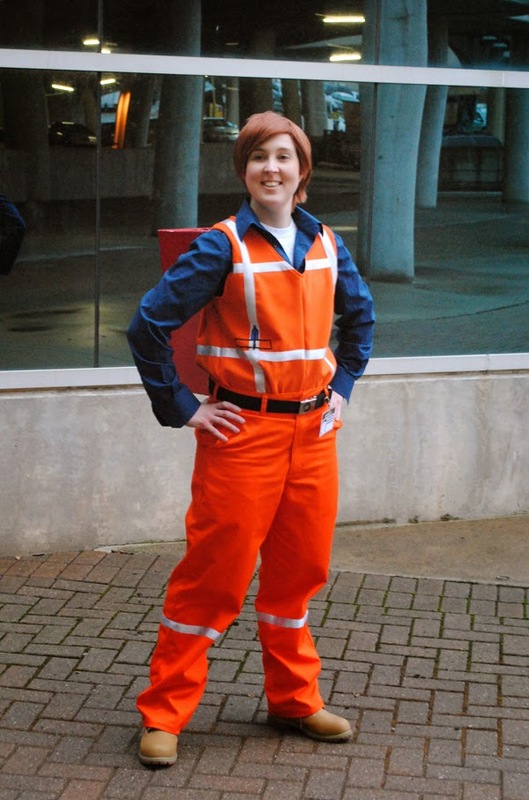 That's right, I made an Emmet Brickowski cosplay from The LEGO Movie. Which I haven't really had the chance to gush about on the blog as I've been swamped with other work. But long story short is that I absolutely LOVE this movie. I saw it 3 times in the theater, and I'd go again. 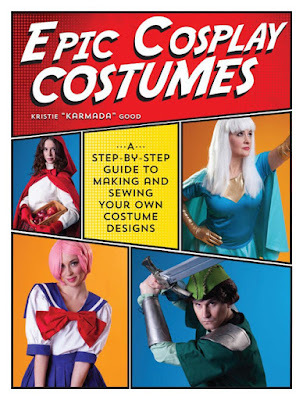 After taking some of my friends to see it, we thought "OMG, it'd be AWESOME (ha ha ha) to do cosplay from this!" 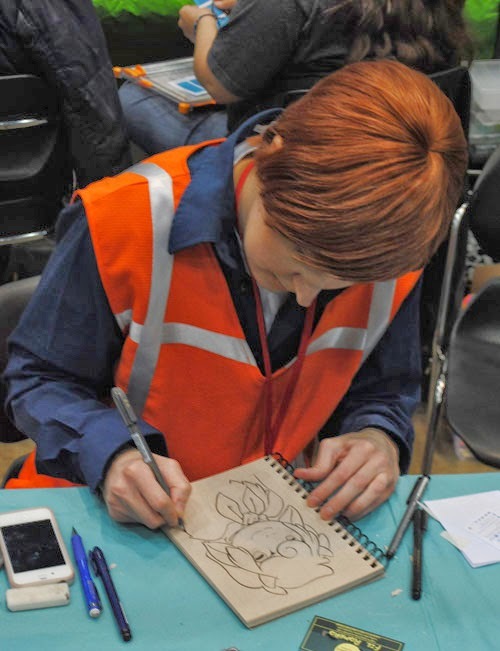 I happened to have Ben Tennison's old wig which was already styled in a similar manner, so I was already prepared. Most of everything else was found/bought, but I did have to make a vest. I also had with me a Unikitty, Bad Cop, and a Wyldstyle! Yep, yep. That's me making funny faces again. ALL THE DERP. So we hammed it up all day in our costumes, all the meanwhile vending in the alley. It was also fun being dressed like this while trying to assemble my own booth. I'll definitely be bringing this one to other shows. It's just too much fun. Bad Cop and Unikitty were my neighbors, Tiny T-Rex Studios! Here's a rare picture of me at my booth. I didn't have too much going on for me during the day, so I got to actually be at my booth, drawing pictures for once! I opened up a new style of commissions this convention, and I must say I had a BLAST drawing them all. I've started making ink and pencil images on brown paper. They look lovely, and I can draw a lot more of them in a day than other commissions! So I'd consider that a huge success. After the alley closed, I headed to my two panels "Her Legs are How Long" and "Time in a Box", and I had a good time showing people how to draw and talk about comic stuff! I apologize if I was a little loopy near the end, I'm going to blame the hotel SleepNumber beds. Which are great if you are 1 person. Bad if 2 people are on the bed. I've discovered that SleepNumber beds are apparently like giant balloons that inflate or deflate depending on what "softness" you want. Basically a glorified water bed but without water. I think I recall I complained about this last year too. Darn beds actually MESSED UP MY BACK and I couldn't sleep. BUT I DIGRESS. I was talking about giving panels. :P Afterwards I went back to the room, and we promptly fell asleep. Okay, well, everybody ELSE fell asleep, and I finished sewing on buttons to my SUPER DUPER SECRET COSPLAY that only like 4 people knew about. For when ONE hat isn't enough. I made like... everything in this outfit. I also constructed most of it in the span of about 4 days. Give or take a day of fiddling randomly with stuff. ANYWAY, so I worked again in the alley all day - and it wasn't until later that evening I was going to be helping with the Cosplay Q&A panel, and stopping by That Game Girl's GameMaster's panel afterwards. Cosplay Q&A was a smashing success, but we'll probably switch up the format a little bit next year and name it something like "STUPID COSPLAY STORIES" or the like. 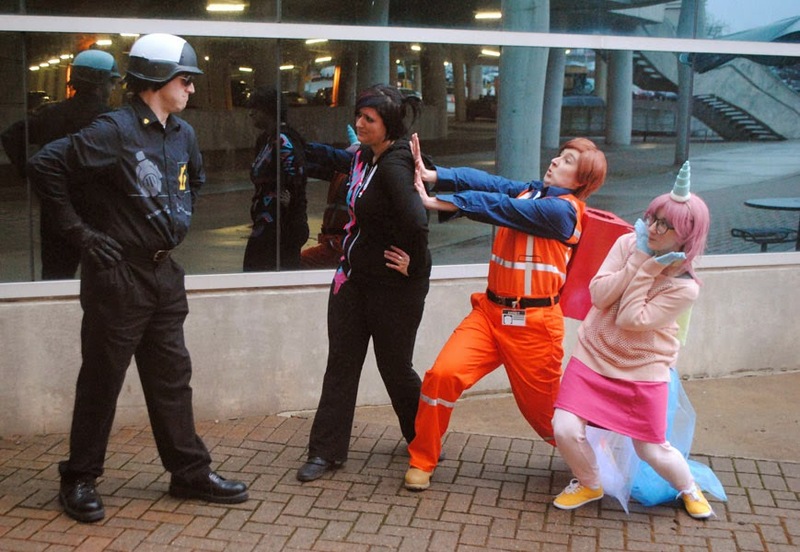 It ended up being tales from the front lines of actual cosplayers doing actual dumb stuff. And good stuff, and gooey sweet stuff. Basically we were just having a discussion about what it's like to be a cosplayer, the good, the bad, the embarrassing. I think that a lot of people enjoyed our tales, so we'll probably work on doing it again at the show, or maybe even others. I'll have to check with my cohorts. :P Though really, any chance to look like a derp I will JUMP ON. I also promise to tell my stories last next time! Apparently I've been doing this too long and have absurd stories for everything. I think we reached CRITICAL HAT MASS. Then after all the hilarity of panels, we shuffled off and fell asleep. Sunday was pretty uneventful, but that's fine by me. I finished up the rest of the commissions, and then packed up to go home. I WAS EXHAUSTED. Overall, the show was pretty good. It felt a little slower than before, but overall I did about the same I usually do at shows. I've got plans for next time, so I look forward to vending there again! 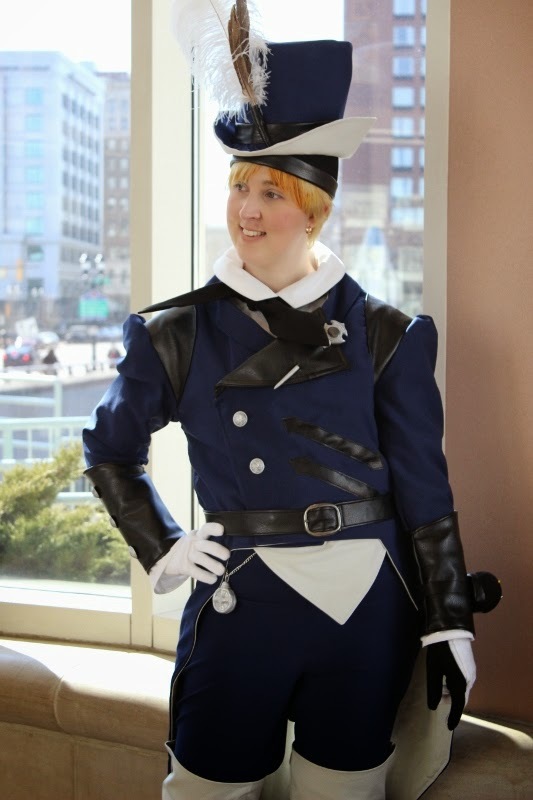 COMING UP NEXT: Shuto Con COMMISSIONS & COSPLAY!